Can a diverse group of college kids find common ground with their school’s faculty and janitorial staff to bring the school administration to its knees? Can they banish a nation’s crippling student debt, guarantee workers benefits and living wages, and implement free college for all? In this galvanizing examination of the fight for free higher education, acclaimed documentarian Rehad Desai takes his own alma mater as a case study in a growing intersectional global movement. At South Africa’s elite, ivy-covered Wits University, students chanting “Fees Must Fall” held a rally against steep tuition hikes. The cry became a viral social media hashtag. One protest fueled another. The administration called in more than a thousand armed police. Soon, a leading institution of nearly 40,000 students was shut down. Neighboring university students struggling with their own mounting debt joined the cause, which become a national movement… one marked by escalating conflict, violence and death. 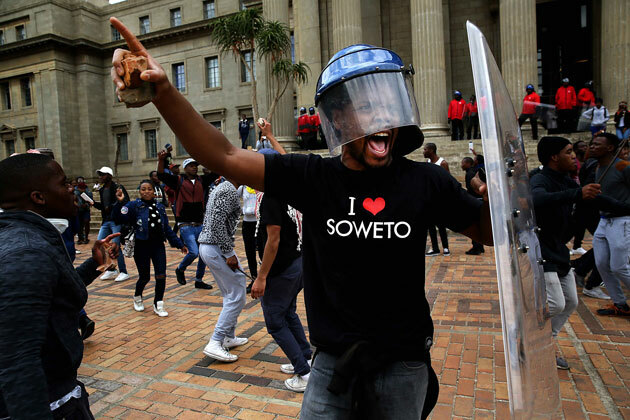 Featuring heart-pounding front-lines footage from the midst of the movement’s essential protests, Everything Must Fall also includes one-on-one interviews with involved faculty members; administrators—including chancellor Adam Habib, himself a former Wits student activist; and the group’s charismatic founding student leaders—Mcebo Dlamini, Shaeera Khalla, Nompendulo Mkhatshaw and Vuyani Pambo—who faced severe consequences for their activism. Even after their fight has led to three deaths, 800 arrests and counting, the students are determined to achieve transformational, intergenerational justice and “decolonized,” free higher education a message increasingly popular in countries worldwide. Aided by two black women journalists, the filmmakers visited workers' barracks, a family planning clinic in Soweto, and a shantytown to create the first and most stirring record of black women's lives in South Africa under apartheid.